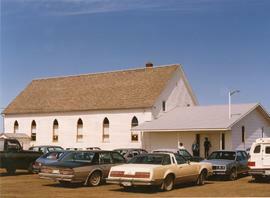 This photo is of George Epps and others arriving for church. 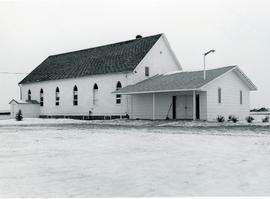 This photo is of old structure with new addition (built in 1982). This photo is of Kenton Willems, Andrew Quiring and Robert Kroeker inspect display at Thanksgiving Festival. This photo is of Mr. & Mrs. Wilfred Plett arriving for Thanksgiving Service. This photo is of 4 Bethany students and 2 children exiting the church. 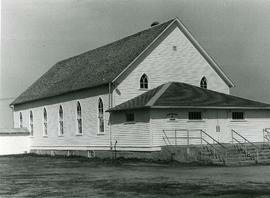 This photo is of the Brotherfield MB Church building. 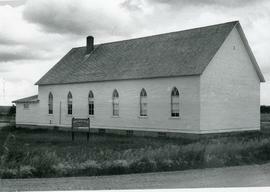 This photo is of the fenced church cemetery at the Brotherfield Mennonite Brethren church, near Waldheim, Saskatchewan.